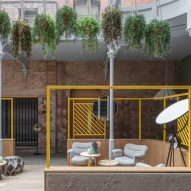 New York-based practice Grzywinski + Pons looks to overcast skies and industrial posters from the 1800s to design the interiors of this hotel in Manchester, England. 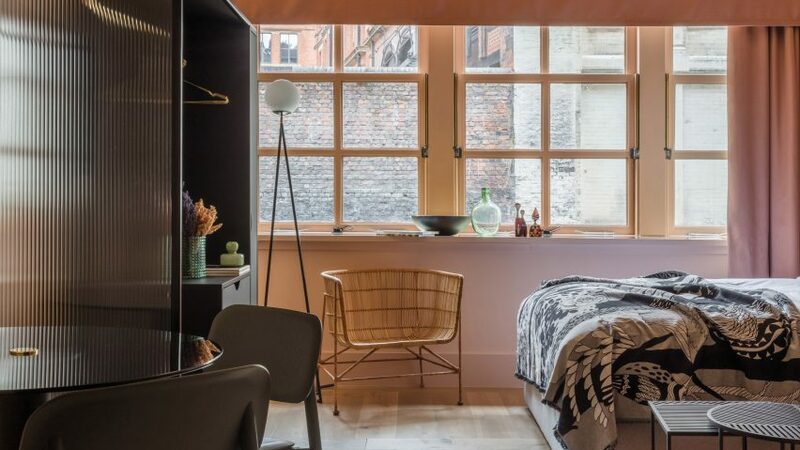 Whitworth Locke hotel is situated in Manchester's civic quarter and occupies a trio of 19th-century buildings that back onto the city's Rochdale Canal. 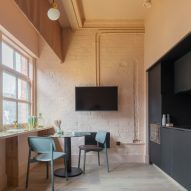 The three connected buildings – previously known as Central House, Dominion House, and Johnson House – all used to serve as cotton mills, but has been overhauled by US practice Grzywinski + Pons to contain 160 guest rooms, a co-working space, bar, and cafe. 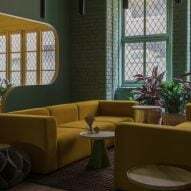 "This commission had special resonance for us as the beautiful former textile warehouses and showroom were highly reminiscent of some of the earliest work we did designing interventions to 19th-century masonry buildings in our native New York City," explained the practice. "The proportions, materials, textures and quality of light we inherited felt a bit like home and demanded to be exalted." 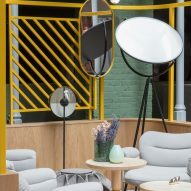 Keen to eradicate unsightly alterations that had been made to the site in the 1980s, the practice first went about renovating a glass atrium, which was formerly just a service road, that links the buildings together. It now boasts a simpler iron framework, opening up views to the outdoors. 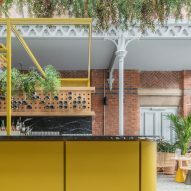 Directly underneath lies pop-up bar The Conservatory, which has greenery winding down over a sunshine-yellow drinks counter and potted plants dotted throughout its seating areas. 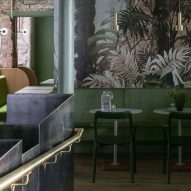 While some of the brick walls have been left in their found state or covered with foliage-printed wallpaper, a majority of other surfaces have been painted various shades of grey in a nod to Manchester's typically rainy skies. 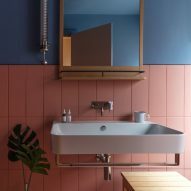 Brighter colours are introduced in the hotel's bedrooms, which take note from vintage posters that advertised trading between the region and the "warmer and brighter corners of the globe". 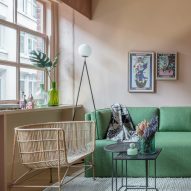 Walls are salmon-pink, while soft-furnishings are upholstered in pistachio-green fabric. 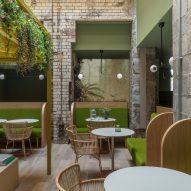 "We loved the link between Merseyside and the equatorial, and as we designed most of the furniture and all of the joinery in the project, we took this as inspiration for both material and formal choices," added the practice. This is the third branch of Whitworth Locke to open, joining branches in London and Edinburgh. 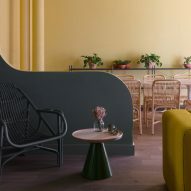 It's not the only hotel to occupy an old building – the recently-opened Hotel Joaquin in California is set inside 1930s motor lodge, while a former Soviet publishing house in Tbilisi, Georgia now plays host to the Samba Hotel.